Straddling either side of the former demilitarised zone (DMZ), the de facto border that nominally ran along the 17th parallel, as a province Quang Tri saw more suffering than most at the hands of the American war. Today, the province continues to struggle. While elsewhere in Vietnam much of the country prospers, here, large portions of the population live deep in the throes of poverty. And with so much UXO (unexploded ordinance) still contaminating the area, both old and young have lost limbs, lives and more. Although still in its pilot phase, one American-funded Livelihood Assistance Programme is providing a more unusual lifeline to families in the region. 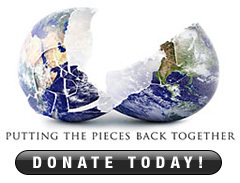 Like the institute that funds it, the non-profit Humpty Dumpty Institute (HDI), it’s a leftfield attempt at making a difference. Says HDI’s president, Ralph Cwerman: "One of our passions is to work on mine action, which among other things is assisting victims who have been injured or disabled by landmine explosion or accidents." In practical terms this has led them to team up with Project Renew to start a mushroom growing project in the region. Through the provision of training combined with micro-loans, there are already 150 families involved. When the programme is in full operation it will equip 1,000 families with the tools and expertise to become professional mushroom growers. "Our main goal here is to build a business," explains Ralph, "a real, sustainable business. And also to give a way for the actual victims [of the UXO and the war] to play a role in the clean up of the mess in Quang Tri." But why mushrooms? Of all the projects that could be found to help create a sustainable livelihood for those in desperate need, it seems the most unlikely. Certainly, it’s not the kind of concept that would be expounded upon in your typical brainstorming session. Although still in its early days, so far the programme has been an unmitigated success. Ralph’s response is remarkably succinct. First, is that it’s not actually that difficult to grow mushrooms — "it doesn’t take up a whole lot of land". It’s not labour intensive, doesn’t require backbreaking work in the fields, and the physically impaired, as long as they are fully mobile, are able to farm the mushrooms themselves. Once the mushrooms have been hung, you quite literally only need to water them. Indeed, the project’s model farmer is Do Thien Dang. 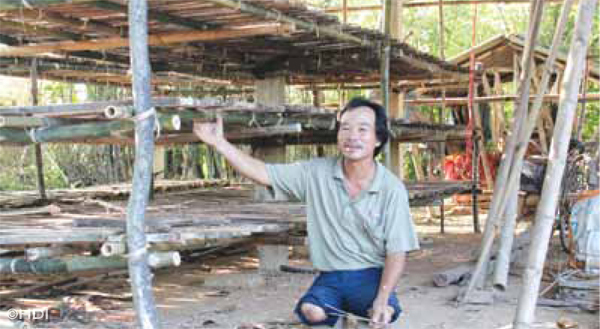 Losing both his lower limbs in 1980 after stepping on UXO while farming his rice field, one of the first farmers to join the programme, he has taken a lead. "He’s a movie star," says Ralph. "He’s in every documentary made about the programme — a Taiwanese camera team recently filmed him for a whole day. We’ve been so impressed with him that we’ve found a little extra money and bought him a three-wheeled motorbike. So, for the first time he has real mobility." Also, while the main beneficiaries of the project are people like Dang, victims of landmines and UXO, the programme has allowed Project Renew to also help single women who have households to look after but with no male support. By taking up mushroom farming they are able to earn much needed extra income, while still having the time to look after their children and keep the daily household responsibilities intact. Seasonally, also, the jigsaw fits together. 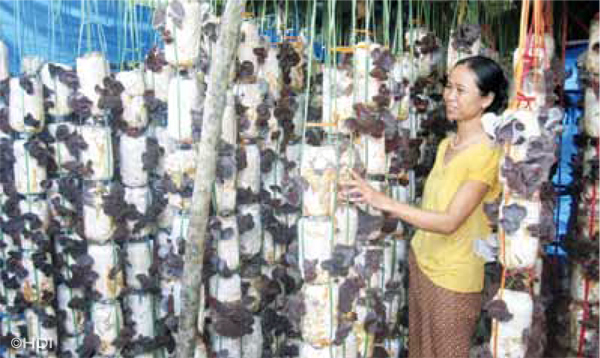 The natural season for growing mushrooms comes right in the middle of the rice farming seasons. So, locals in the area have the time to focus on cultivating mushrooms without affecting their ability to work the fields. 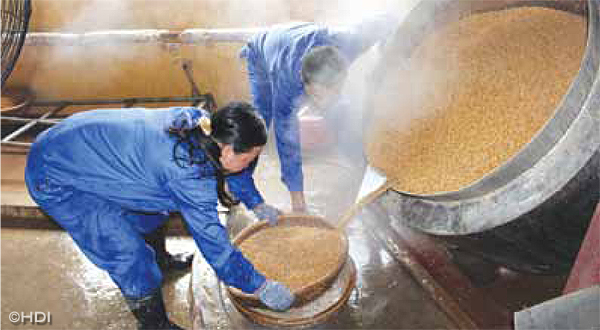 Under the brand name Namus, at present the project is growing four different types of mushrooms: wood ear, shiitake, oyster and the expensive, medicinally valuable linghzi. Once harvested, Project Renew buys back all the mushrooms the farmers can grow, paying slightly higher than the market price. This way, the farmers can guarantee the sale, and through a repayment system, the project can ensure that the farmers can repay their loans. "Everyone laughed. Some people still laugh. But it’s much less. 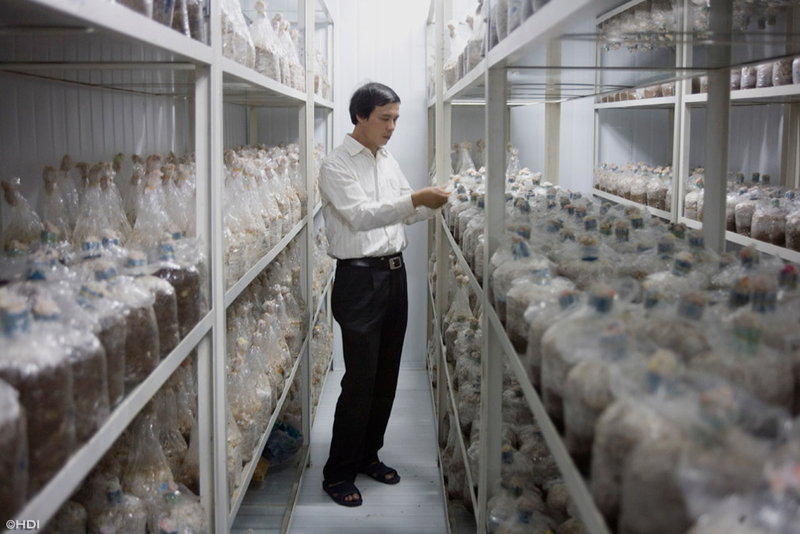 For the first time, the real mushroom growers in and around Vietnam — it’s a US$40 million business here — are starting to pay attention to what we’re doing"
"Ultimately our goal is to export the mushrooms," says Ralph. "We’re not just there in volume yet — last season we grew 5 tonnes of wood ear — and we’re still only selling the mushrooms locally. But we will soon be starting to sell them in both Hanoi and Ho Chi Minh City. We just need to increase our volume." To become a real force in the market, though, Project Renew needs to create barriers between Namus mushrooms and any competitors. Thus, the goal is for these mushrooms to have full organic certification. "Right now there are three steps to get there," says Ralph. "First you need Viet Gap certification, which allows us to sell in Vietnam. Then there’s Global Gap and after that there’s full organic certification." It’s a difficult process. In some of the remote areas where the farmers live, it’s not easy to explain and enforce some of the activities they have to be responsible for in order to achieve and maintain the organic certification. But, there isn’t anyone else cultivating organic mushrooms in Vietnam right now. And the mushrooms have both a natural and powerful marketing tool — the story behind them. Also, any profits will be ploughed into a fund to remove landmines and UXO. "In my earliest speeches I would say that we wanted to turn Quang Tri into Vietnam’s mushroom capital," recalls Ralph. "Everyone laughed. Some people still laugh. But it’s much less. 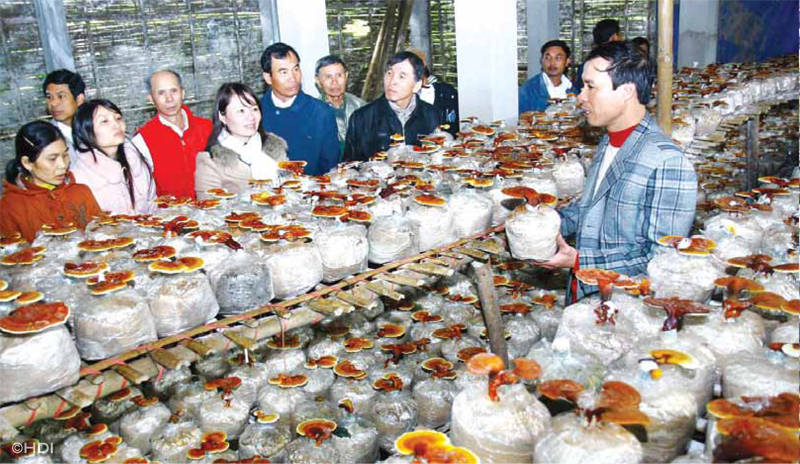 For the first time, the real mushroom growers in and around Vietnam — it’s a US$40 million business here — are starting to pay attention to what we’re doing." For more information on Mushrooms with a Mission, go to Project Renew’s website — www.landmines.org.vn. You can view the PDF of this article here.